I think that it is not wrong for boys to wear pink because it is just a colour that anyone could wear.As a matter of fact I have seen many boys dress up in the colour pink! Yes, they can wear pink because pink is a colour that anybody can wear without having the feeling that they are being watched, should’nt wear it or be afraid of being called names. 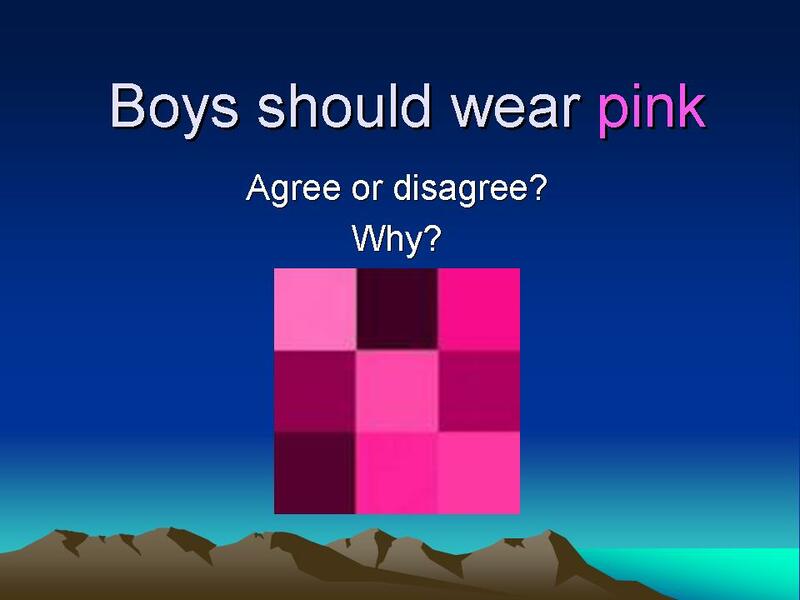 I agree because there is nothing wrong with boys wearing pink, and I disagree because they shouldn’t have to wear pink if they don’t want to. Pink is just a colour. Some boys look at the colour pinks as a girls colour but it isnt.. Many girls wear blue, so why cant boys where pink? Our opinion is that boys should be able to wear any colour they like. boys should wear pink because boys always were blue, grey or black. pink is just a colour. I think you can wear any colour you desire to as long as you chose it because is your decision to wear pink blue green or indigo it does not matter what you wear. i think boys should be allowed to wear pink it they want to without being forced not to wear it or being forced to wear it.boys can wear any colour they like same for girl. boys you shouldn’t be embarrassed !